So for the next several days, we will be giving you some additional creative ideas for using the dies. Our cards today are all about St Patrick's Day. 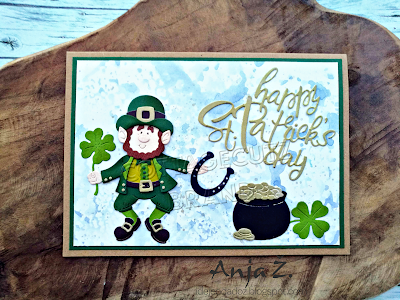 Card 1: The first sample today is one that I (Mary Marsh) created using the new St Patrick's Day Cupcake die. 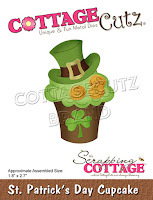 I thought this cupcake image would make a great card for an Irish friend of mine. She celebrates the day with full gusto (lol)!!! I followed the MojoSketch508 for my card layout. The green leprechaun top hat makes a perfect topper for the cupcake. And, the gold coins that are part of the die fit so well with the Irish blessing sentiment. Card 2: Our next sample for today is from Anja Zurga. 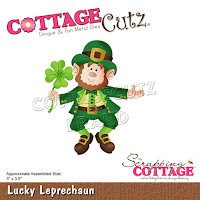 She used the super cute Lucky Leprechaun die. 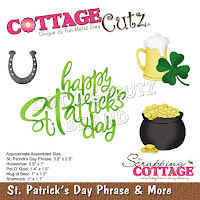 For her sentiment, pot of gold, shamrocks and good luck horseshoe, she used the St Patrick's Day Phrase and More die. Anja creates such great backgrounds with distress oxide inks and for this one she used the smooshing technique. Here is a link to the tutorial she followed. This card would be perfect for any of your Irish friends, a great teacher thank you card or for any of your special little ones. Card 3: Our last sample for today is from Janja Albreht. She used the St Patrick's Day Cupcake and the St Patrick's Day Phrase & More to create her good luck card. The leprechaun top hat and pot of gold accent both corners perfectly. For another creative touch, she filled the center of her square with shamrocks with gold coin centers. This would be a great card for someone retiring, or starting a new job or even as a graduation card. Think out of the box because our dies can always be used for other occasions. Well, that's our samples for today. I hope the team has given you some inspiration on ways to use these new dies. Make sure you stop by again tomorrow for more team samples. Fabulous cards ladies! I love all of the St. Patrick's Day inspiration! Such a fun group of St. Patrick's day cards love all of the creativity!